November is Peanut Butter Lovers Month and boy to do we have the stuff for you! 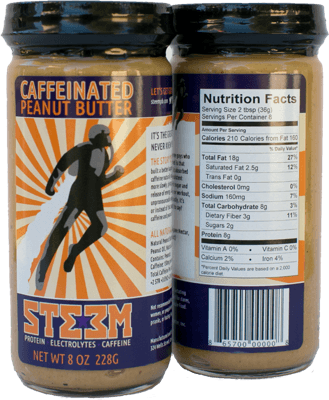 STEEM is caffeinated peanut butter locally made. If you need an energy boost in the afternoon but don’t want to settle for an energy drink or ran out of time to stop by the Barstow’s Drive Thru this morning for an iced coffee, this is the perfect pick-me-up to keep your desk drawer at work! STEEM is designed to provide a consistent release of sustained energy and the naturally slow digestion of peanut butter is the key to that. 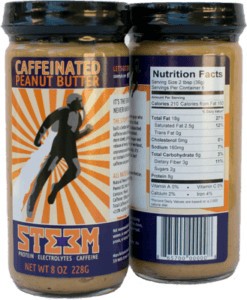 STEEM Peanut Butter delivers protein, electrolytes, and caffeine, granting you hours of endurance and focus, and freeing you from distractions like hunger and fatigue! STEEM is made with natural peanut butter, and no artificial sweeteners. Oh, and as much caffeine as two cups of coffee, so stick with the normal serving suggestions for the best effect! Enjoy it however you would normally enjoy peanut butter: spread it on crackers, toast or fruit, or re-acquaint yourself with the simple perfection of the peanut butter and jelly sandwich! STEEM is a small company based in Greenfield, MA. Check out their website at www.steempb.com.